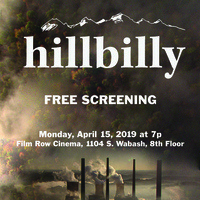 Columbia College Chicago is proud to host the Chicagoland premiere of hillbilly, the 2018 documentary by directors Sally Rubin and Ashley York. A discussion with the directors, moderated by Doug Reichert Powell (English and Creative Writing) and featuring Co-director of Academic Diversity, Equity, and Inclusion Raquel Monroe, will follow the screening. In hillbilly, directors Sally Rubin and Ashley York show the evolution of the uneducated, promiscuous "hillbilly" stereotype in media and culture, linking it with corporate exploitation of Appalachia’s natural resources. The film examines the experience of rural voters and seeks to expand the understanding of the region by featuring diverse communities in Appalachia, including Appalshop's Appalachian Media Institute where young adults find community and refuge, and the Affrilachian Poets, a grassroots group of poets of color living in the Appalachian region.